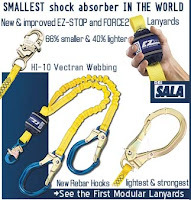 DBI-SALA's new and improved EZ-STOP shock absorbing lanyards and the world's first modular lanyards are now in stock. These lanyards feature a shock absorber that is 66% smaller and 40% lighter than standard shock packs. Also with special high strength thinner webbing, made from HI-10 Vectran webbing. New engineered snap hooks and rebar hooks that are the strongest and lightest in the industry. Check out the new innovation in fall protection today.